Reducing class size is often promoted as a surefire way to improve student achievement. The argument is intuitive and simple: The fewer students per teacher, the more individualized attention each student will get; the more individualized attention, the better students learn. Yet smaller class size has less impact on outcomes than its backers would have people believe. For example, class sizes in Michigan have been shrinking steadily for more than a decade without any measurable boost in student achievement. This is also one of the most expensive proposals for changing outcomes. The argument that smaller class size yields better outcomes is not entirely groundless. An experiment done in Tennessee nearly 30 years ago known as the STAR project did find that, on average, students in the lower elementary grades randomly assigned to smaller classes performed better on standardized tests than peers in larger classes. Some education researchers have questioned the study’s methodology, and others have shown that, while statistically significant, the effect was nevertheless limited and relatively small. Importantly, beyond the confines of a single modest study in a single state, reducing class size on a large scale has not been linked to improved learning. In 1997 and 1998, California gave out an average of $725 more per pupil to schools that reduced class sizes to 20 students in kindergarten through third grade. Florida has spent $20 billion since 2002 to reduce average class sizes by three students in certain districts. Studies of both states have found no conclusive evidence that all the extra spending raised student achievement. 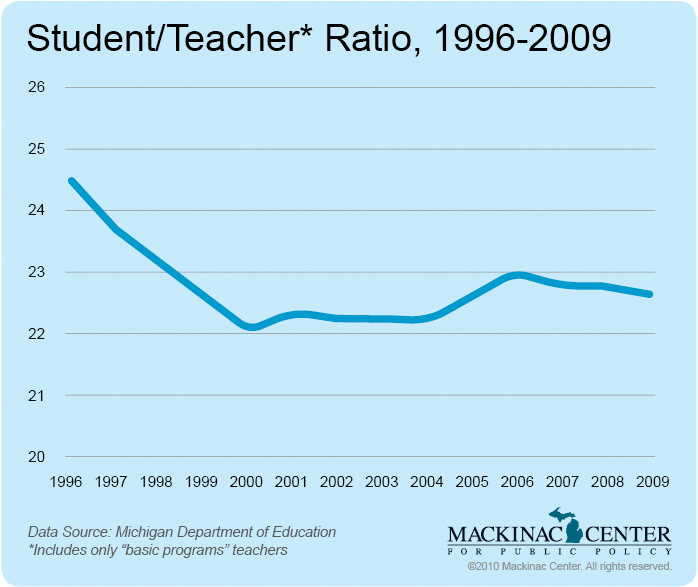 Although Michigan hasn’t undertaken any similar large-scale initiatives, the statewide pupil-teacher ratio has still fallen considerably. 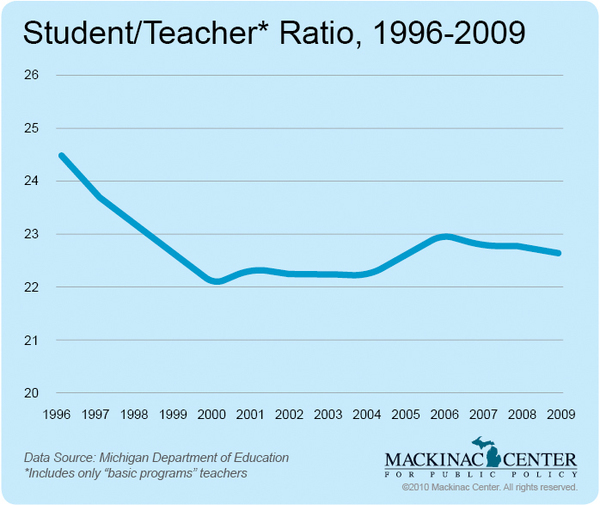 From 1996 to 2009, the ratio of students to certified, “basic programs” teachers dropped by 7.5 percent, from 24.5 to 22.6, according to the Michigan Department of Education. Furthermore, the ratio of students to all school employees fell by 12 percent over this same period, and now there’s one school employee for every 7.8 students. Moreover, pupil-teacher ratios have shrunk nationally for at least the last six decades, yet there have been no quantifiable improvements to student achievement nationally or in individual states, including Michigan. Indeed, student performance in the United States lags behind many industrialized nations where class sizes are substantially greater. These facts don’t prevent the public school establishment from continuing to push for smaller classes (and thus more teachers), but the costs here would be prohibitive. Given no change in the current level of teacher salary and benefits, reducing student-teacher ratios in Michigan by 10 percent (from 22.6 to 20.3) would cost taxpayers some $1.3 billion, or $850 per pupil. The state would have to boost combined school revenues from personal income taxes and the 6-mill state education property tax by one-third to afford this extra expense. Reducing class sizes to 15, (as in the STAR experiment and advocated by teachers unions) would more than triple the amount needed. Other unseen costs need to be considered, too. To cut class sizes, the state would have to hire a slew of new instructors, potentially diluting quality of the teacher labor pool. Additionally, since funding would be directed to putting more instructional bodies in classrooms, districts would be less able to incentivize the most effective classroom teachers to stay by offering them pay increases. These cost increases don’t even take into consideration the expenses that would be involved with building more classrooms to accommodate the smaller student-teacher ratios. It’s no coincidence that the nation’s two largest teachers unions both adamantly support reducing class sizes. For the American Federation of Teachers and the National Education Association, a lower teacher-per-student ratio means more members, more money and more political power. As the NEA’s retiring general counsel admitted in 2009, that power stems solely from the hundreds of millions in dues that more than 3 million members fork over each year. Reforms such as improving teacher quality are far more cost-effective, and have been shown to actually boost student achievement. Unfortunately, seniority-based staffing policies dictated by union contracts and state tenure laws prevent districts from identifying, attracting and rewarding high-performing teachers and putting them in front of as many kids as possible. Information about the project can be found at “Project STAR” (Health & Education Research Operative Services, Inc). http://www.heros-inc.org/star.htm (accessed October 13, 2010). Jay P. Greene, Education Myths: What Special Interest Groups Want You to Believe About Our Schools — and Why It Isn’t So (New York: Rowman & Littlefield Publishers, Inc., 2005), 52-54; Eric A. Hanushek, “The Evidence on Class Size” (W. Allen Wallis Institute of Political Economy, 1998), http://www.wallis.rochester.edu/WallisPapers/wallis_10.pdf (accessed October 13, 2010). Edward Wexler et al., “California’s Class Size Reduction: Implications for Equity, Practice & Implemenation” (PACE-WestEd, 1998), http://www.wested.org/policy/pubs/full_text/class_size/toc.htm (accessed October 13, 2010). Paul E. Peterson, “Florida’s Class Size Amendment: Did It Help Students Learn?” (Education Next, 2010), http://educationnext.org/floridas-class-size-amendment-did-it-help-students-learn/ (accessed October 13, 2010); Matthew M. Chingos, “The Impact of a Universal Class-Size Reduction Policy: Evidence from Florida’s Statewide Mandate” (Program on Education Policy and Governance, John F. Kennedy School of Government, Harvard University, 2010), http://www.hks.harvard.edu/pepg/PDF/Papers/PEPG10-03_Chingos.pdf (accessed October 13, 2010); What We Have Learned About Class Size Reduction in California, eds. George W. Bohrnstedt and Brian M. Stecher (Sacramento: California Department of Education, 2002). Author’s calculations based on the Michigan Department of Education’s annual “Bulletin 1014” report, available at http://www.michigan.gov/ mde/0,1607,7-140-6530_6605-21514--,00.html. 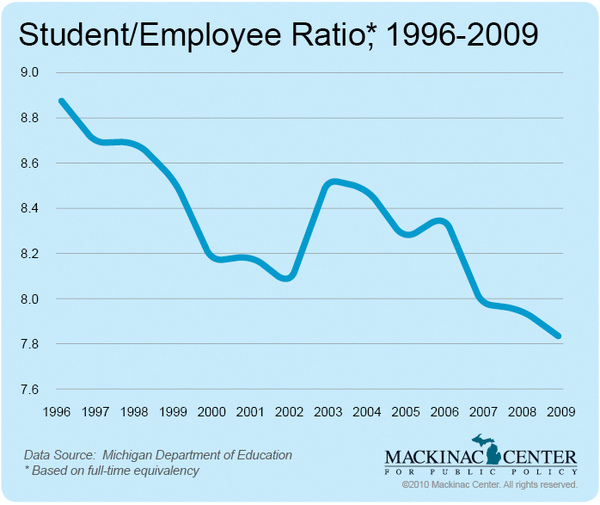 Author’s calculations based on “full-time equivalencies” data provided by the Michigan Department of Education’s Center for Educational Performance and Information, available at http://www.michigan.gov/cepi/0,1607,7-113-21423_30446---,00.html. “Table 64: Public and Private Elementary and Secondary Teachers, Enrollment, and Pupil/Teacher Ratios: Selected Years, Fall 1955 through Fall 2018,” in Digest of Education Statistics (National Center for Education Statistics, 2009); Bobby D. Rampey, Gloria S. Dion, and Patricia L. Donahue, “The Nation’s Report Card: Long-Term Trend 2008” (National Center for Education Statistics, 2009), http://nces.ed.gov/nationsreportcard/ pdf/main2008/2009479.pdf (accessed October 13, 2010). Maria Glod, “U.S. Teens Trail Peers around World on Math-Science Test,” The Washington Post, December 5, 2007, http://www.washingtonpost.com/wp-dyn/content/article/2007/ 12/04/AR2007120400730.html (accessed October 13, 2010). Caroline Hoxby, “The Cost of Accountability” (Hoover Institution, Stanford University), http://media.hoover.org/sites/default/files/documents/ 0817938826_47.pdf (accessed October 13, 2010). 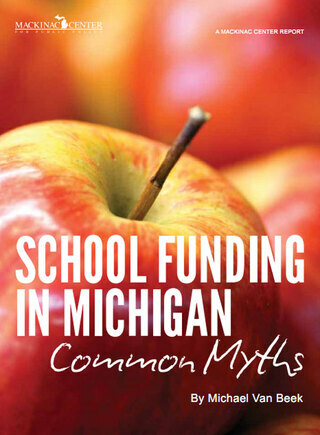 Author’s calculations based on data from the National Public Education Finance Survey, available at http://www.mackinac.org/depts/epi/fiscal.aspx. “Class Size: Priorities for Changing NCLB: A Federal Class Size Reduction Program Is an NEA Priority in Rewriting NCLB” (National Education Association), http://www.nea.org/home/13120.htm (accessed October 13, 2010). “Class Size Reduction: A Proven Reform Strategy” (National Education Association, http://www.nea.org/assets/docs/mf_PB08_ClassSize.pdf (accessed October 13, 2010); “Benefits of Small Class Size” (American Federation of Teachers, 2010), http://www.aft.org/pdfs/teachers/ ib_classsize0410.pdf (accessed October 13, 2010). “NEA General Counsel Bob Chanin Says Farewell,” http://www.youtube.com/watch?v=-piPkgAUo0w (accessed October 13, 2010). Marc J. Holley, A Teacher Quality Primer: For Michigan School Officials, State Policymakers, Media and Residents (Midland, MI: Mackinac Center for Public Policy, 2008), 19. Also available at http://www.mackinac.org/9579.